I don’t know about you, but grocery shopping gets a lot more fun for me when summer turns to fall. Mums, apples, pumpkins and other fall crops fill the produce aisles, and seasonal items with fall flavors start appearing all over the store. One of my favorite aisles to check out in the fall is the candy aisle, to see what kinds of special fall candies are out for Halloween. Hershey’s has a number of special candies out for Halloween this year, including Kit Kat Halloween Bars, Cadbury Screme Eggs, and Jolly Rancher Caramel Apple Lollipops (all perfect for handing out to trick-or-treaters!) 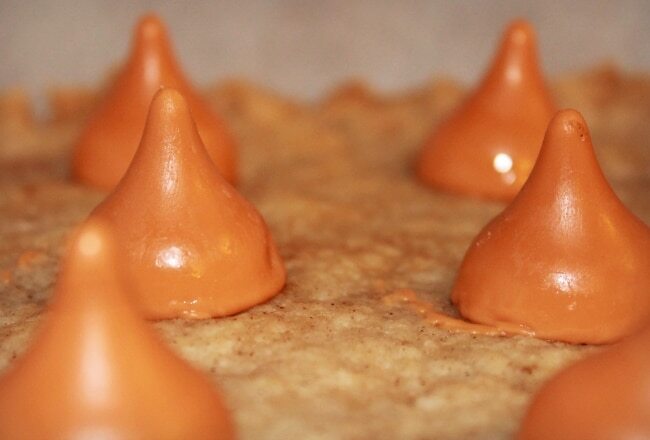 … But the one that caught my eye for baking Halloween and fall-themed goodies was Hershey’s Pumpkin Spice Kisses. 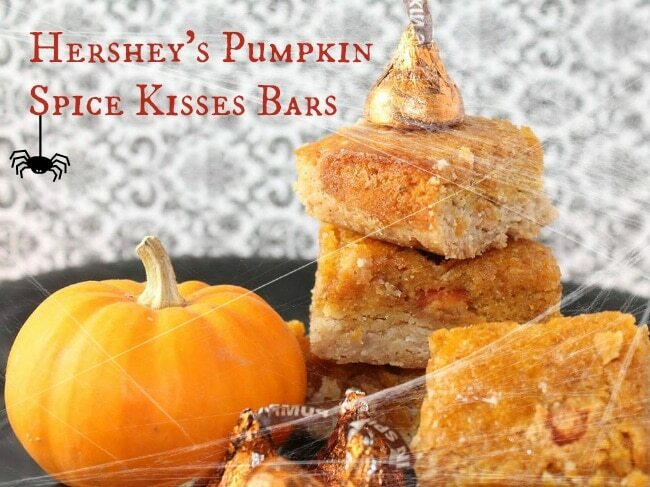 I thought it would be fun to put the Pumpkin Spice Kisses inside a baked Halloween treat, so I came up with these Hershey’s Pumpkin Spice Kisses Bars. They are like a pumpkin pie bar cookie, with the added surprise of a Pumpkin Spice Kiss in the middle (yum, right!?). These bars are the perfect TREAT for Halloween parties or sharing with little ghosts and goblins in the neighborhood ...but if you’re a pumpkin lover, like me, they might not last that long! This recipe was home grown, but if need more inspiration for Halloween crafts, recipes or party ideas using Hershey’s candy, check out Celebrate with Hershey’s. These Hershey's Pumpkin Spice Kisses Bars are like a pumpkin pie bar cookie, with the added surprise of a Pumpkin Spice Kiss in the middle! Heat oven to 375 degrees. Grease and flour an 8×8 pan or line it with parchment. Mix melted butter with the sugar, flour, cinnamon and salt until dough forms. Flatten dough into pan by pressing with your fingers. Bake about 15 minutes, until crust starts to turn golden brown. Whisk sugar, eggs, flour and pumpkin butter in a mixing bowl until well blended. When crust comes out of the oven, place the Hershey’s Pumpkin Spice Kisses evenly on the crust. Pour the filling mixture around the candies. Bake 30 minutes, until filling is puffed and set in the middle. Cut into 16 2×2-inch squares. Enjoy! This post is sponsored by Global Influence with product provided by Hershey’s. All opinions are my own. Mmmm I love me some pumpkin. I’ve been trying new pumpkin recipes, I’ll have to add this to my list! Those definitely look quite tempting! I seriously need to get the Pumpkin Spice Kisses before the season is over. That’s a really creative way to bake with this holiday kisses! Thank you Hershey’s for coming out with Pumpkin Spice Kisses! YUM! 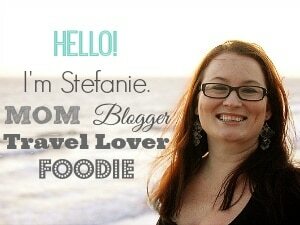 I’m totally digging the webbing over the snacks! And it sounds really good, I love anything with pumpkin. I haven’t been able to find those yet but I keep looking and looking! Your bars look fantabulous! These sound delicious. I’d love to try the Hershey’s kisses. Those are delish and so perfect for Halloween. I will definitely be making these. Those look delicious! I need to try making them too! Recipes like this are the reason I love Halloween. This sounds amazing! We actually purchased the Hershey’s Pumpkin Spice Kisses and really enjoyed them. I would like to place an order!! Hahahaha these look really really good!!! Looks like I got some baking to do! This looks like the perfect fall treat! Such a fun recipe!!! I wish I wasn’t doing a sugar detox because I would SO make these this weekend! Looks like the perfect trey for those who love pumpkin! First, they have hersheys spice kisses?! Second those bars look amazing! Ooh I haven’t seen those Hershey’s but now I’m totally going to be watching for them! These bars sound delicious! I need to find these kisses!!! These look so delicious and are just perfect for Fall. I haven’t tried these kisses yet, but totally need to pick some up and try your recipe. I love ANYTHING pumpkin!! -Thanks for sharing! Ooohhh, that sounds delicious. Thanks for sharing the recipe. Hopefully I’ll be able to try it soon! Pumpkin spice kisses? How am I just now hearing of these? Yum! Mmmmm Pumpkin spice! I would LOVE these! I’m definitely going to have to make these soon. Thanks!